I told Adam the other day that if I'm completely honest with myself I think it's harder this way. This prolonged goodbye. It's better, absolutely, but it's harder, too. We've been up there the last six weekends since Grandpa got sick. Many visits in the hospital and one beautiful day together at his home. We've had time. Time to make sure he knows how much we love him, how much he has impacted our lives, time to pass on messages from friends and family, time to pray together and time to cry. Time to say our goodbyes. It's heartwrenching to see my Grandpa, my hero, who was always so strong, so vital, so much larger than life, sick and weak - dying. It's hard to face his mortality, and it's impossible to wrap my mind around the impending loss. It takes all my strength to walk away each Sunday thinking that it is probably the last time, to let go of his warm hand and walk out the door. If I'm honest - it'd be easier to stay away. I'd rather run away from my emotions and not face them head on. Over and over and over again. And while I'm being so honest - it'd be nice to have weekends at home again. We are tired. We are selfish. We want to stay home. But I'm learning the practical application of a lesson whose theory I have long known. This is life - all of it, good and bad, hard and easy. 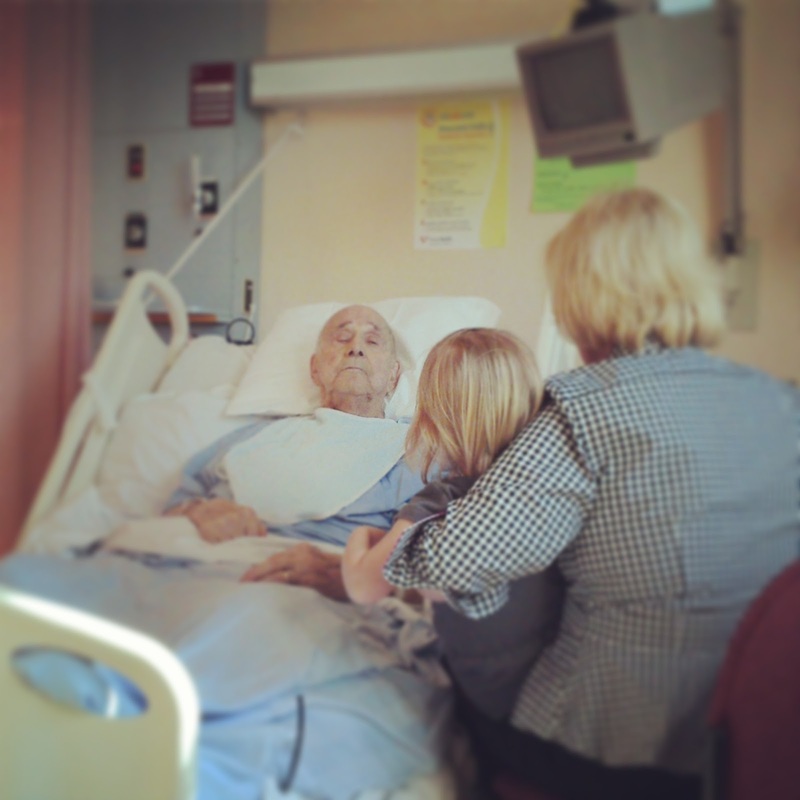 Grandpa has brought more joy, laughter and love into my life than I can express. The very least I can do is to enter into the pain and the sorrow and the hard times with him. I don't only get the fun times. I don't have that right. And here's the thing. This isn't for him anyway, not really. While I'd do anything in the world for him, he doesn't need us there. He knows we love him and he is certainly not wanting for visitors. We're the ones benefiting the most from these visits. These beautiful, heart-wrenching moments together. I don't only get the fun times. And, I don't want to. This is harder, but it is better. I am so sorry for your struggle. I am sorry that you're losing someone you love so much and the pain that brings to your life. I'm sorry for the energy it demands of you - emotionally, physically, mentally. I sincerely wish I could wipe away all of the pain and struggle...but, because we just walked through the anguish of Holy Week, I realize that is such a weak, human response. To wish away pain is to wish away the contrasting love and joy, and I would never do that to you or anyone! As I reconsider my words I am reminded that we have to look at The Cross to understand our pain and begin to embrace it as a means by which to make sense out of it. I am reminded that because Jesus did ALL that He could for us on the Cross it is simply our job to walk beside him and rend our hearts that He might heal us and One Day banish all pain, struggle, and sorrow. So instead of wishing I could erase your pain I will simply pray - for you, your family, and your grandpa and ask for your forgiveness me for my weakness. Thank you for being honest and for reminding me to rend my heart. I am always touched and inspired by your beauty, strength, and faith. Sheri you find words to express so beautifully what most of us can't. Thank you, dear one. I remember that Uncle Albert once said that he really only had two sermons that he preached. The love of God and the cross. He has touched each one of us in a special way because he truly lived those words. Thank you so much!